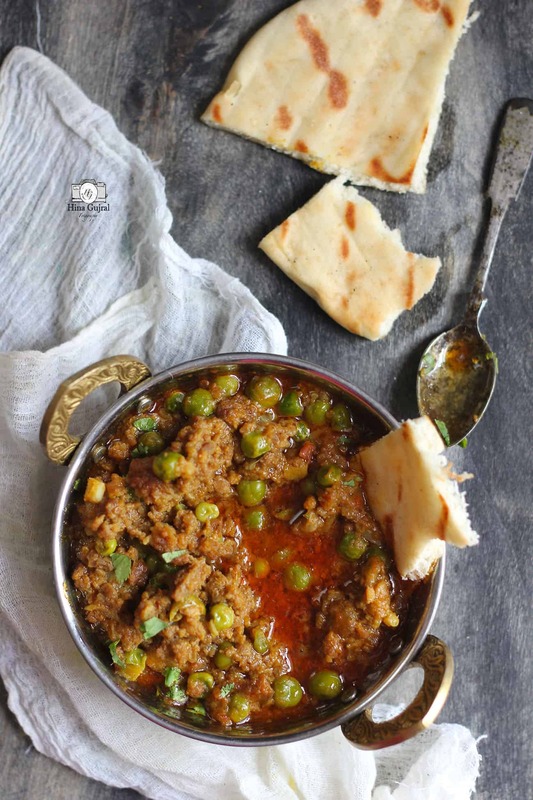 Keema Matar is the spicy, bold mutton mince curry embellished with fresh green peas. 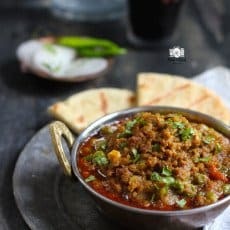 Keema Curry is undoubtedly one of our favorite mutton curries from the days when I could not even spell the word keema. The morsel of soft and pillowy Mughlai bread such as naan dipped in a delicious keema matar curry burst with flavors in the mouth. There is a kind of unsolicited comfort in each bite of Keema Matar. The long wait at the butcher’s shop for the fine cut mutton mince is all worth it. It took me a while to cook, click and share this keema curry recipe on the blog. 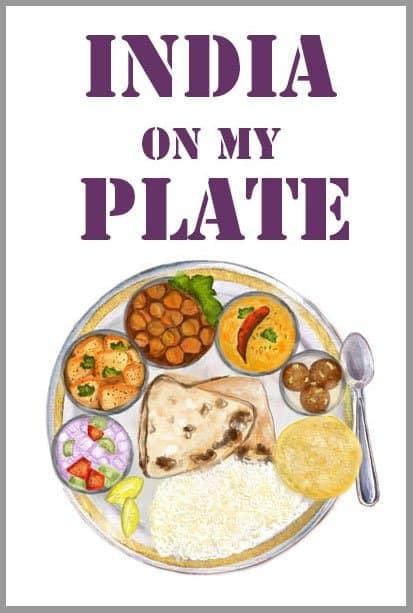 A couple of times I tried recreating my mother’s keema matar recipe but that striking flavors were missing from the curry. Like many other recipes, it also made to the wish-list – ‘how to get it right’. When we packed our bags to complete the long-awaited personal project ‘connect with roots’ the wish-list of ‘how to get it right’ recipes also came all the way along with us. The day was Sunday, ingredients were arranged and recipe already sorted, all I have to do is recreate the magic of mom’s keema curry under the expert guidance of mother-in-law. 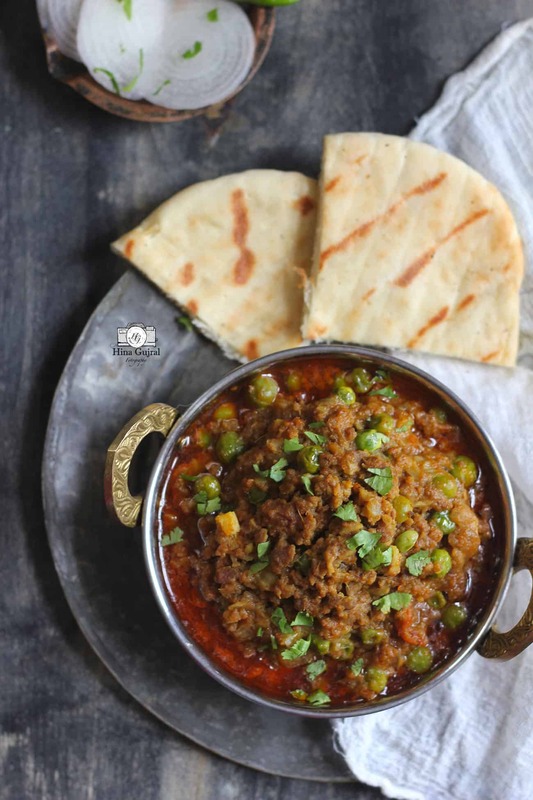 There is a kind of precision and patience required while making curries like mutton keema. You have to wait for the right time to add salt, bright color of roasted onion gives you the signal of doneness, succulent juices of the meat brighten up the curry, these were the secret mantras which were missing from our earlier attempts to make the perfect keema curry. In amidst of hoopla of urban living and in a rush to master the dish without understanding the basics working behind the scene, I could have never learned the right way to cook mutton keema matar curry. 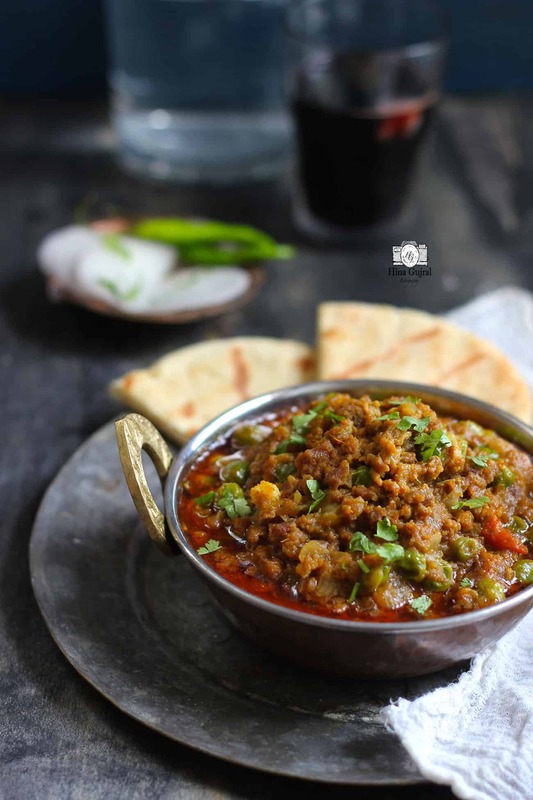 How to make delicious Mutton Keema Matar? It is always best to use fresh mutton mince instead of frozen or ground meat to make keema curry. The taste and texture of the curry highly depend on the fibrous texture of the meat. While roasting the meat never keep track of time. Allow the mutton mince to change the colour while roasting. When well roasted the meat will release a kind of sweet aroma and it’s colour changes to pale brown. Do not add too much oil while frying the onions for keema curry. If well roasted the mutton mince will release fat of its own in the curry making it all the way more delicious. 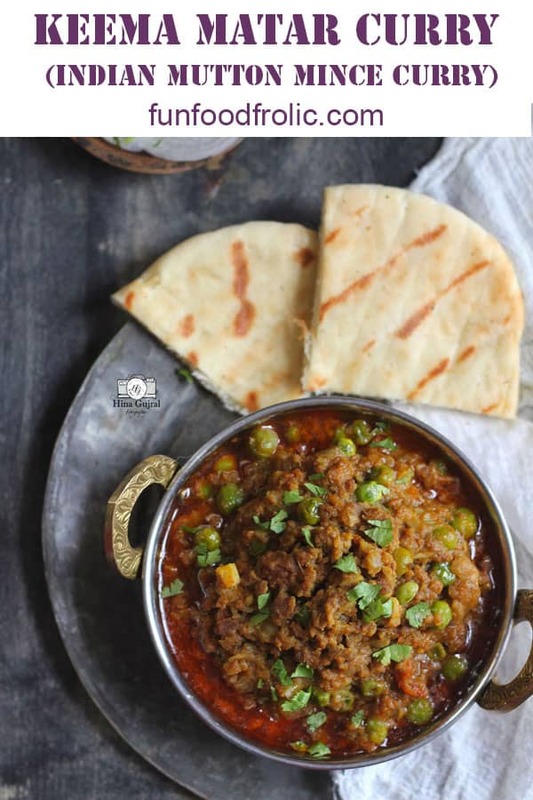 Instead of pressure cooker/instant pot, you can make this keema curry in a slow cooker as well. It is not the whole spices or garam masala that gives flavour to the keema curry. The true flavour comes from the perfect roasting of the onion and the mutton mince. 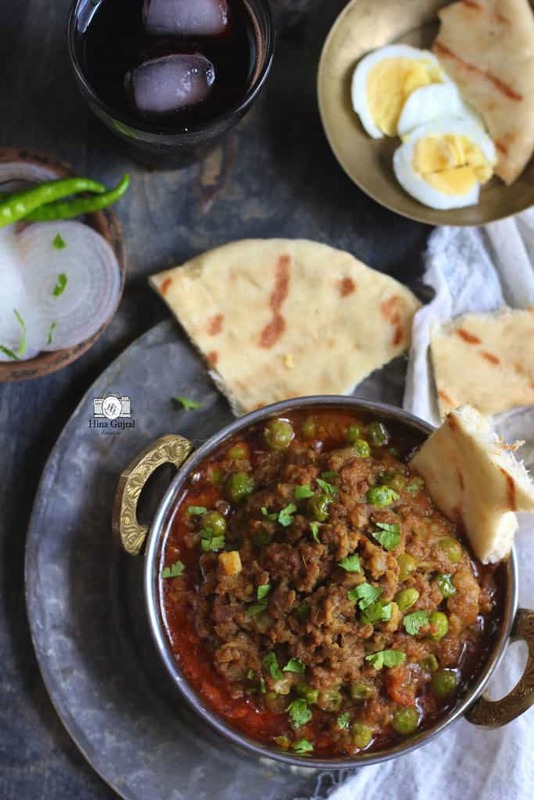 Keema Matar is the spicy, bold mutton mince curry embellished with fresh green peas. Learn how to make delicious keema curry in a few simple steps. To prepare the Keema Matar, clean, rinse and pat dry the mutton mince. In a pressure cooker ( buy it here ) heat oil over medium heat. Add bay leaf and once aroma of bay leaf is released add the chopped onion and green chili. Fry over medium heat till onion turns dark brown in color. Add ginger garlic paste along with a tablespoon or two of water. Fry till the raw aroma of paste is gone and the paste turns brown in color. Now add mutton mince in the pressure cooker and fry for 10 - 15 minutes over medium heat. The color of mince will start changing to pale brown. Add salt, turmeric, red chili powder, stir to combine and fry for next few seconds. Add 4 Cups of water or just enough to cook the mutton mince. Cook over medium heat for 2 - 3 whistles. Let the steam release naturally from the pressure cooker. Open the lid and add chopped tomato along with garam masala. Stir to combine. Transfer Keema Matar to a heavy bottom saucepan or casserole ( buy it here ). Simmer, covered with the lid over low-medium heat, stirring occasionally in between. Garnish Keema Matar with chopped coriander leaves. 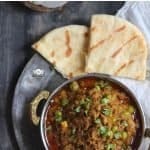 Serve Keema Matar warm with Naan ( see recipe here ).